I’m happy to announce that Vees are here! As is a marketplace to exchange Vees and the ability to buy and run Vee Missions. Vees are our new rewards points system which you can earn from companies and individuals who send out Vees Missions. Eaves is our currency created through the Social Market game, and can be used to run Missions and play the Social Market game. Vees will only be distributed through Missions. Want to give out Vees? You can buy Vees here! We are currently creating customized Vee packages and would be happy to chat with you! I’m excited to be able to show you the first step in our Vees Marketplace which is the ability for you to exchange Vees for Gift Cards in the United States, Canada and UK. This is just the beginning. In all three regions, Amazon and Starbucks gift cards are available. In US and Canada we also have Crate&Barrel. In Canada only we have Best Buy Canada. We’ll be expanding our Gift Card offerings. 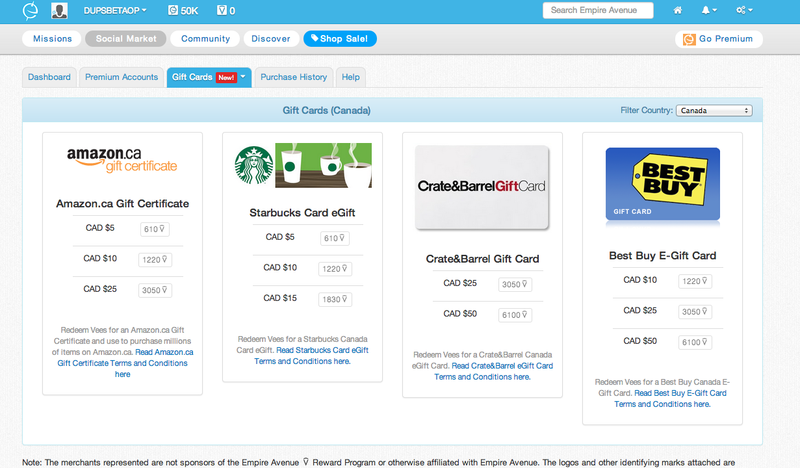 If you are a business, large or small, that wants to offer Gift Cards for Vees through Empire Avenue, please contact us! Want to see a specific retailer on there? Let us know! We’ll be expanding the Vees Marketplace. Our goal is a marketplace that supersedes your imagination, all rewarding you for being social. From Digital Entertainment to possibly packaged deliveries at your door -- whether by drone or by dog sled. We have a thread on our General Discussion to discuss this post and more! Q. Will you give out Vees to everyone on Empire Avenue? Vees will be distributed through Missions on Empire Avenue. We’ve already put up a Promoted Mission for Vees on Empire Avenue, please go do it to get your first batch of Vees! Q. What is the difference between Eaves and Vees? Eaves is our internal currency used in the Social Market game. We generate Eaves for you to play with, people investing in you in the game gives you Eaves. Doing Eaves Missions will earn you Eaves as well. Vees are rewards points that companies and individuals can obtain from Empire Avenue to reward people through Missions for discovering content and people. Q. Will you allow us to convert Eaves to Vees? In general, no. However, we are considering certain promotional exchanges over the next few months to thank our long time members who wish to take advantage of such promotions. More details will be made available when ready. Q. Will you allow us to convert Vees to Eaves? Absolutely. We haven’t finalized an exchange rate. It will likely be a floating exchange rate based on the Social Market economy. We’ll announce this when ready. Q. What’s next for the Vees Marketplace? We've announced a Digital Entertainment marketplace. Stay tuned. We’re working with some of the most well known brands in the world, but we also want to be available to small and new businesses! Q. Can I convert Vees to US Dollars? Q. Can I use the Vees I earn from Missions to run my own Vees Missions? Q. Can I buy Vee's in bulk? Contact us! We’re happy to chat with you, we believe there’s a package waiting for you. Q. Can I transfer Vees between accounts? Q. Can I get discounts as a Premium Subscriber? Absolutely. We just haven’t announced what the pricing and discounts will be and at what levels. We are still working through the numbers. If you are a Premium Subscriber and want to buy Vees, please contact us so we can work with you!